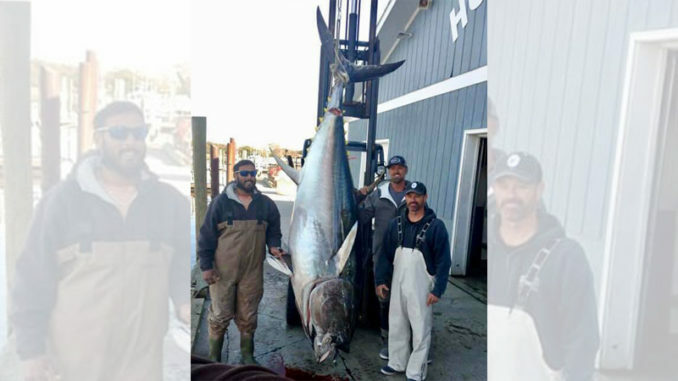 Jim Ellis, Adam Clark, and Mickey Patel caught this 657-pound bluefin out of Atlantic Beach. 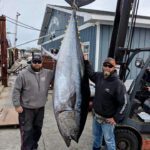 The folks at Chasin’ Tails Outdoors Bait & Tackle in Atlantic Beach, N.C. have been reporting some good bluefin tuna catches regularly since the season opened on Dec. 1. On opening day, the Merry Marlin Fishing crew got on the water early and was back before 9 a.m. weighing in at Chasin’ Tails with a bluefin that weighed 186 pounds cored. Then Brad Kimrey of New Bern and Dylan Rhudy brought in an 88-inch bluefin which cored out at 247 pounds. On Dec. 4, Capt. Jared of the Tombstone pulled into dock with a 400+ pounder that he caught while fishing with his dog. That’s quite a beast to pull in alone! Capt. Jared, with his 4-legged first mate, with their 400+ pound bluefin tuna. 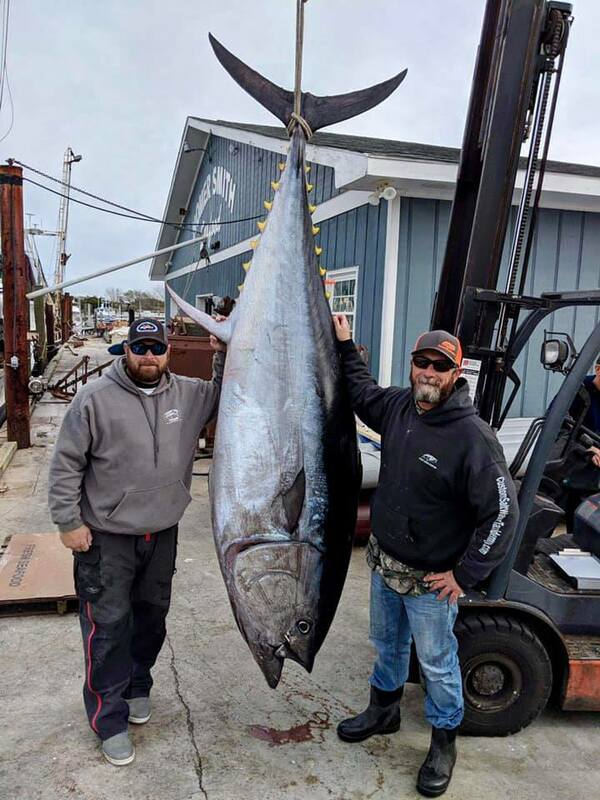 Jim Ellis of Goldsboro, Adam Clark of Durham, and Mickey Patel of Peletier teamed up to bring a 657-pound bluefin back to the docks on Dec. 6 after toughing out several days of rough conditions and some bad luck. And the next day, Ellis, Patel, and Joe Bendis did it again with another 600+ pounder. It was the crew from Procrastinator Sportfishing’s turn on Dec. 12, when Capt. 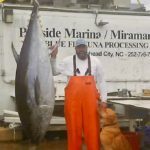 John and Frank brought in a bluefin that weighed over 500 pounds. Capt. James Nick Nance and Capt. 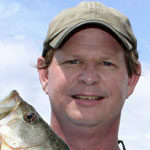 Christopher Graham Kimrey of the Mount Maker got in on the action on Dec. 13. They caught a tuna just shy of 700 pounds. Capt. James Nick Nance and Capt. 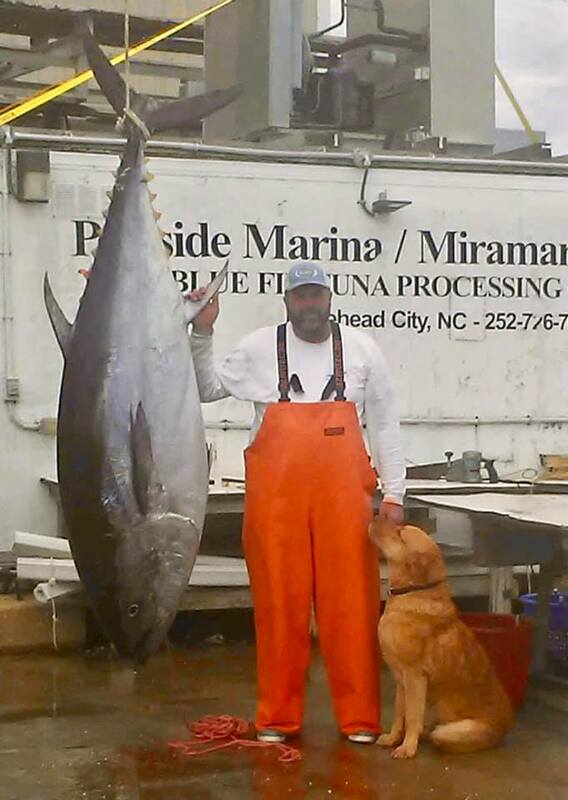 Christopher Graham Kimrey reeled in this tuna that weighed almost 700 pounds. Horse and Select Ballyhoo from Baitmasters of South Florida has been the go-to for tuna anglers. Crews have battled the weather these past two weeks, but the good weather days have provided some great catches. As good as the tuna bite has been, the wahoo bite has been just as good, if not better, with lots of fishing being caught around Swansboro Hole up toward Big Rock. But the key to finding them has been less about location, and more about finding the warm water breaks. Bottom fishing has also been great. Grouper, sea bass, and snapper are all biting strong. When you’re ready to book a trip, give the folks at Chasin’ Tails Outdoors a call at 252-240-3474.